This year 2nd April was celebrated as Mahaveer Janm Kalyanak (Janm means birth, kalyanak means an occasion to purify ourselves and others). How and in what manner can we remember Mahaveer? Can we share some inspiring stories of Mahaveer with our younger ones? I would like to share with you the stories of Mahaveer that I listened from my mother about 40 years back. My mother never visited any school. However, she had attended her classes in Gyanshala, Poshala and Upasara (traditional Indian education centers, which are now almost extinct), and therefore, she was highly learned and would instantly frame songs and could narrate many stories. The way she could narrate stories was so outstanding that a person could remember the story throughout the life (so do I). Once a serpent (snake) came rushing towards Mahaveer to bite him. Mahaveer was full of compassion and equanimity. Devoid of any feeling of fear, hatred or aversion, he remained calm and standing. As the snake attacked Mahaveer, the snake got milk instead of blood. The snake became follower of Mahaveer. Compassion prevails over hatred. Everyone has to bear burden of his own karma. Even if we have only thought bad for someone, this too will have consequence on our future (this is called pudgal, which accumulates whenever we have any bad intention or thought and would leave our soul through self-purification). Mahaveer gave emphasis on self-restraint, self-penance, self-purification. He would practise meditation and would remain without food and water as a part of self-penance. He asked people to understand the law of this universe and to try to attain the ultimate goal of human incarnation i.e. moksha or nirvana or kewalya gyaan (moksha or kewalya gyaan means highest level of knowledge, where a person is able to differentiate body and soul and is liberated from the cycle of birth and death and is free from the impact of all karma or actions). He had many great disciples, who had also attained kewalya gyaan. One such disciple was Chandan Bala. Chandan Bala was a princess. Her father lost a battle and as a result she was captured as a prisoner by the enemy soldiers. The soldiers wanted to sell her to earn money. Chandan Bala prayed to the God to save her chastity. Fortunately, a rich businessman was going that way and he felt that he should help the girl, thinking that Chandan Bala belonged to a good family (he guessed it on the basis of her appearance). He purchased Chandan Bala from soldiers, brought her to his home and kept as his daughter. Chandan Bala served him as a fatherly figure. The wife of the businessman doubted the intention of the businessman and didn’t approve of his action and tortured Chandan Bala. Chandan Bala was a very intelligent girl, and followed chastity and honesty to the highest standards. She realized that due to her beauty and her long beautiful hair, the lady might be having jealousy. She got her hair removed so that she wouldn’t look beautiful. Chandan Bala was very religious and tried to practise all the principles of Jainism. She had heard that Jain Saint Mahaveer had come to her city. She wanted to listen to the sermon of Mahaveer – but this was not possible. Once, the businessman left the city for business purpose, and left alone Chandan Bala faced all types of tortures from the wife of the businessman (who was just waiting for this occasion). One day, while she was lying as a prisoner in her room, she had only a few pieces of grams (chana) with her and she was aspiring to offer this to some saint as Bhiksha (Bhiksha means offering to a saint). She knew that it would not happen, yet she was just praying to herself. All of a sudden she saw Jain Saint Mahaveer, who was passing through that route. She got excited and wanted to offer her grams to Mahaveer as Bhiksha. She tried to come forward as much as possible. Lord Mahaveer also came forward to collect the offerings. It was the greatest moment of joy for Chandan Bala. She was extremely excited with joy, as she was going to offer Bhiksha to Lord Mahaveer; her dreams were coming true. She just couldn’t believe herself. Suddenly, Lord Mahaveer who had come near her, returned back without accepting anything. Chandan Bala felt that she was an ill-fated girl. She started weeping. She felt as the most unlucky girl in the world. Seeing her in tears, Lord Mahaveer returned back and accepted grams from her. 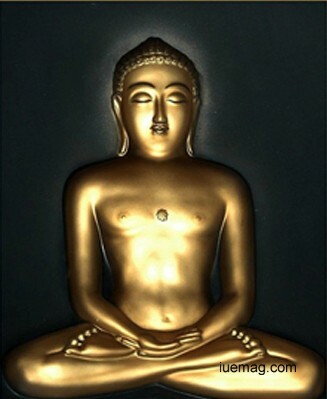 Lord Mahaveer had not taken any food for six months. Later, he revealed that he had taken a vow that he would take food only if some conditions were satisfied, and one of the conditions was that the donor should be tied as a prisoner and should have tears in eyes. Chandan Bala fulfilled all the conditions of the vow, and therefore, Lord Mahaveer accepted food. Chandan Bala later became a Sadhvi (saint) under Lord Mahaveer. She practiced Non-Violence, Truth, Chastity and non-accumulation with devotion. One night, she was sleeping with other lady saints. While it was dark night, she woke up and asked other Sadhvies (lady saints) to stand up and give way to a Cobra (a snake) so that it could pass through. In the dark night, when nobody could see anything, she was able to see the Cobra. Other Sadhvis were surprised. Later, they realized that she had already attained Moksha (the ultimate knowledge). Any facts, figures or references stated here are made by the author & don't reflect the endorsement of iU at all times unless otherwise drafted by official staff at iU. This article was first published here on 8th April 2015.